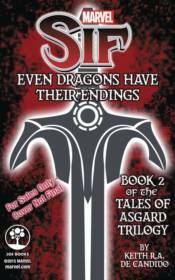 In book two of Marvel's Tales of Asgard Trilogy another legendary hero takes center stage, as Sif comes to the defense of a village under attack by a dragon. But this is no ordinary dragon, and when Sif tracks it to its lair, she learns that the dragon used to be a man, cursed because of his lust for gold. Now she must find a way to save both the village and the man within the beast. The epic trilogy continues with The Warriors Three in the final installment of the series, coming in June 2016.